Much of my week is spent in conversations or work sessions with compliance professionals across a broad spectrum of the business world. It should come as no surprise that we talk a lot about managing risk. It’s the nature of the job. But the most common conversational topic is almost always about corporate culture. Regardless of the industry, company size, or level of management, at some point just about every person I speak with mentions that they have a “conservative culture.” Nearly everybody says this, but how can this possibly be true? To provide some context, I happen to work at the world-renowned improvisational comedy institution, The Second City — an environment that is decidedly not conservative. Our theaters have specialized in social, political, and corporate satire for more than 50 years, holding a mirror up to society, engaging audiences with laughter, emotion, and at our best, sharing a unique perspective on the world. We create our material through improvisation – working without a script – and adapting, moment to moment, until we find what resonates. It’s the ultimate crowdsourcing: Audiences will tell you what’s true. We are able to succeed at this for 364 nights a year, by actively fostering a culture of open communication, collaboration and trust, where ideas (both good and bad and in between) are shared without judgment. Perhaps the topic of corporate culture is raised so often in these compliance conversations because of the perceived contrast. Or maybe it’s because, like bartenders or shrinks, improvisers are good listeners. But for whatever reason, the subject comes up…a lot. The idea that our colleagues in the business world feel they exist in a “conservative culture” fascinates me. Most people don’t identify with it as individuals. They think, “I’m not that way, but we are.” But many people readily buy into the mindset, and few feel ownership over it, or truly feel empowered to change it. In fact, people often use it as an excuse not to change, which comes at a cost. Here’s what we know: Ethics and compliance professionals are trying to mitigate risk. They do this by creating and enforcing rules, raising awareness about the importance of the subject matter, educating around these issues, and parsing vital nuances in/around compliance requirements, so that employees can successfully do their jobs in a way that plays within the rules. Ideally the goal is to change behaviors. Here’s what we also know: People get bored. They are busy and they don’t always listen or pay attention, unless you really give them a reason to do so. What’s more, people don’t engage unless – well – what you’re offering is engaging. So, if people don’t listen, pay attention, and engage – guess what? They don’t learn and they don’t change. This helps to explain why “playing it safe” and doing things “the way we’ve always done them around here” – the so-called same-same strategy – has a price tag in the governance, risk and compliance space. And it can be a very big price tag. How can you get people to change? What should you do differently to affect corporate culture, shift to a focus on behaviors and learning and ultimately mitigate risk? To quote the world famous improv comedian, Mahatma Gandhi*, “Be the change you wish to see in the world.” I think this is particularly applicable in the corporate world today and especially relevant to the compliance professional. If you are in one of those “conservative cultures,” then you have the opportunity to change it. The reason corporate cultures become “conservative” in the first place is typically connected to fear, and specifically the fear of failure and fear of offense. You know the drill: “Oh that’s a great idea, but we could never do that here.” “Well I love it, but it’ll never go over with my boss.” “Well, our US employees would appreciate that but I’m not sure about our European employees.” And so on. And guess what, with those sentiments, nothing changes and few people learn or move forward. The simple truth is: We are getting in our own way. Self-described, “conservative cultures” typically exist because of a lack of authentic communication that respects the intelligence of the audience. As that’s the case, the compliance professional needs to change the way they think about communication, which requires a different mindset and a different set of skills. *After further research, it turns out that Gandhi never applied himself as an improviser. But he sure seems like he was a pretty calm, intelligent and swell guy. I bet he’d be great at auditions. *The word “conservative” appears in quotes in this context because it’s a fallacy…a false label. Companies are made up of humans, and humans like to be engaged, entertained and actually like to learn new things. 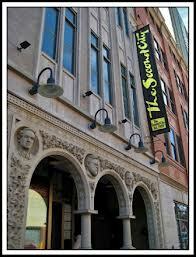 The Second City’s stages sell out every night. Our reputation packs the house, but that doesn’t mean they are engaged. Our performers are laser focused on winning over the audience, each and every moment and each and every night. Your employees are an audience, and a captive one at that. Much of your training is required. But you’re not exactly playing to a “warm room.” In fact, the more serious the issues, the more often people come into the conversation with their own preconceived notions – nervous, fearful, apathetic, angry for taking them away from what’s “really important” etc. The higher the stakes, the greater the need to focus on communication and engagement. You can’t just push policies at people. You need to win them over. Improvisers, actors and performers in general understand that What you say is affected by How you say it. And great improvisers tend to be great communicators – great listeners, great collaborators, focused on their scene partners, and really attuned at reading body language, tone, status and all sorts of other verbal and non-verbal cues. These skills are relevant and some might say essential to today’s compliance professional as you try to build an environment of transparency and trust. As an example, you can have a difficult conversation in a positive way. This can apply to a conversation; do you have an open hand or are you wagging the finger (both physically or metaphorically)? It also applies to other ways of presenting information whether that be through video, courseware, PowerPoint, e-mail, web copy and so on. These are mediums that can be used for evil (boring!) or good (interesting!). Once you have your messaging down (i.e. the What) adjust based on How the audience might best receive that information, and you have a better chance of engaging and connecting. And if you approach the serious stuff in a positive, more informal way, people tend to pay attention and real, genuine learning transfer can occur. Here’s an observation that might startle some folk: Most employees and sometimes even management tend to be people. And in business, people often conform based on a perception (real or otherwise) that “that’s just the way we do things around here.” That helps explain why Death by PowerPoint is a common affliction in so many organizations. But employees are business people some of the time and regular people all of the time. They listen to music or talk radio; download books or podcasts; watch broadcast television and chuckle at the commercials; go to the movies, go online to watch YouTube videos or clips of the news; connect with others via Facebook, LinkedIn and other social platforms. These are basically different storytelling devices that we take for granted. These devices work for a reason, because they are effective ways to communicate. The more we can overlay these common every day platforms to our most important subjects, the more effective we’ll be. *Guess what? These conventions are not just for Millennials and Hipsters. 1/3 of all American’s now own tablets and not all of them have ironic facial hair and tattoos. People across the world access information differently today, no matter what age. In improv this is essential. We involve the audience in the show and they feel a part of it. This equates quite naturally into learning theory. That’s why we are seeing a proliferation of training and communications that involve gamification, choose your path, contests, ethics Jeopardy and so on. Interactive dialogues are always more effective than monologues. And with today’s social learning platforms, it’s actually easier to involve employees than ever before. Next time you are creating a training, ask employees to contribute. Next time you push out some important information, ask them to do some action in response. People tend to engage and learn when they are actively involved….plain and simple. All methods don’t work for every audience. And even if they did, they wouldn’t always work the second and third time. Variety of stimulus is key. This is why sketch comedy tends to appeal to such a wide audience. There are a monologues, relationship scenes, songs, metaphorical scenes, reality based scenes, different styles and genres. Some are short and some are long. The art form is built to appeal to a wide range of sensibilities. *May not be an actual quote. But it probably is. I had the pleasure of participating in on one of Second City’s storytelling workshops and one of the lessons that really stood out for me was the power of story.. In business, if you were going to tell the story of the Three Little Pigs, it would be told like this: “33% of the pigs prefer straw.” That is how we tend to communicate in business and I would argue, in compliance as well. There’s no story, just legalese, without a who, what, when, where and why. It’s important to not just think of a story simply as how you spin a yarn with your buddies or family members. Story is made up of specifics, colorful metaphors, protagonists and antagonists, and usually transformation. These are all critical elements to how one can convey both trivial and essential information. In addition, things like music, video, dance, infomercials, even interviews and panel discussions are all different ways to communicate and tell a story. *I’m not suggesting an interpretive dance about the UK Bribery Act (although that I’d like to see). Just making a point. Compliance training is not like the movie “Field of Dreams”…If you build it, they will not come. As the compliance community has evolved as a profession, more and more companies seem to have the fundamentals in place. There is some combination of policies, courses, training decks, e-learning programs, learning management systems, case studies, and so on. But yet the same problems persist. So do you really need more training? The challenge typically is, how do you get more people accessing and engaging in the training, policies and key learning you already have in place. Taking a marketing approach to training can help – teach them where to go, drive them there, and remind them regularly and often. More and more companies are having success with the “vitamin approach.” Historically, companies had the big once a year training inoculation. Then everyone signs a form they didn’t read saying the learned something that they didn’t. It’s like we train like pythons eat. We swallow a whole warthog in one sitting, fall asleep and don’t eat again for months. (In this analogy the warthog is your training…sorry.) Shorter, more frequent, more snackable communications, allows you to increase awareness of key messaging, and drive activity to those policies and resources you already have. And if you embrace a more positive, more social approach, these vitamin communications can start to affect the way these topics are perceived. It’s a way to build an audience over time and train them that these important topics are not so scary and are rather accessible. An interesting observation in the improv world is that, beginning improvisers when feeling their way through a scene tend to fall into argument. And the audience doesn’t like this. If they wanted to see people argue they’d stay at home (budum bump). But when you dissect this peculiarity, it’s because it’s a lot easier to say “No” than it is to say “Yes.” “No” is safer. “No” stops action. But it doesn’t get you as far and turns people off. Audiences enjoy watching people go on an adventure together, to solve problems and conquer challenges. “Yes” is more inclusive and more collaborate. I invite you to think of “Yes” not necessarily as agreement, but affirmation and acceptance – I’m listening, I’m hearing you and we’re going to solve this problem together. By the way, even though my business is based on utilizing humor and entertainment to more effectively convey these sorts of issues, I purposely haven’t talked about humor in this piece – because it’s not about that. There are many tricks, tools and devices that can be used to help engage your workforce and win mindshare. And blending entertainment and learning is but one of them. This piece is about creating a positive corporate culture and the role of compliance professionals as change agents. Your roles intersect with the entire corporate enterprise which puts you in the perfect place to start creating the culture that you and your colleagues actually want. And hopefully in time, this will help me from ever having to hear, “but we’re a conservative company,” ever again. Ronnie Feldman (rfeldman@secondcity.com) is the Product Director for RealBiz Shorts, the innovative ethics and compliance video communication series developed by Second City Communications, the business solutions division of The Second City, in Chicago, IL.